Since March 2011 when the IWDG received an email from Conor Haughey offering the IWDG a gift of Celtic Mist a lot has happened. Celtic Mist is a 56ft ketch, but primarily a motor cruiser with a large 350 hp caterpillar engine as well as two sails and a jib. It was built in Brittany in 1974 and bought by the late late Charles J. Haughey in 1984, to replace Celtic Mist 1 which sunk off Mizen Head, Co Cork. Celtic Mist is famous throughout Ireland and abroad and the offer to the IWDG came as a complete surprise. On receiving the offer, the IWDG commission a number of surveys in the Isle of Wight, England where it was lying. These surveys were favourable and IWDG Director Fiacc O’Brolchain, together with 4 sailing friends flew to the Isle of Wight to give it a thorough inspection. At this stage we had accepted the offer from Conor Haughey and were readying it for the Tall Ships race in Waterford. Fiacc and his merry crew completed the passage to Waterford in heavy seas and Celtic Mist was the only Irish entry to the Tall Ships. Fiacc and Garry Davies skippered Celtic Mist from Waterford to Greenock, Scotland under sail and manual piloting with a crew of young and old. On reaching Scotland an IWDG crew joined the vessel to bring Celtic Mist to Kilrush, Co Clare via Tory Island, Co Donegal and Inishboffin, Co Galway. Celtic Mist reached Kilrush on 17 July 2011. On arrival in Kilrush, Fiacc had made a list of 75 items that needed to be fixed. Some of these were simple (attach coat hook or screw), some not so simple. The refit was put out to tender with a cost of 65,000 euro the winning tender. IWDG applied to Clare Local Development Company, who administer LEADER funding in the county for financial support. 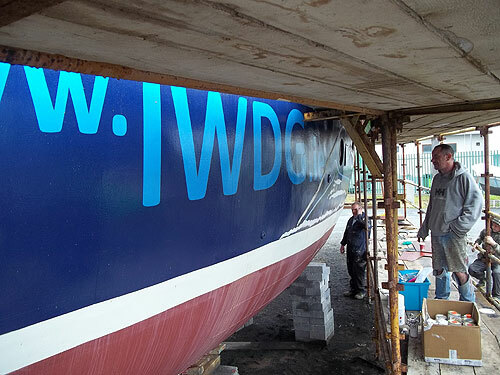 Fortunately IWDG were successful and were awarded 75% funding towards the refit, a total of 48,000 euro. The refit commenced January 2012 in Kilrush boatyard. Since then we have stripped the vessel down to its hull over large areas. The aft cabin (Charles Haugheys cabin) has been ripped out as we wanted to increase the number of berths from six to eight and this involved replacing his double bunk (bed), shower and bath with a skippers cabin and a cabin with two bunks as well as replacing the aft heads (toilet and sink). During this work we discovered holes in the hull, especially around the aft cabin and stern. This was a shock and a quote of 12,500 euro in steel work confirmed out fears. Fortunately Clare Local Development Company offered 75% funding towards this extra cost and the work was commissioned. More welding of the hull required the four water tanks in the engine room to be removed, fuel tanks to be cut open, cleaned, power-hosed and welded up. The engine room was stripped and all surfaces, bilges and fittings, cleaned and painted. It looks magnificent – pity that nobody will see it !! The bulk of the work has been carried out by volunteers meaning we have tackled many more jobs than the 75 on Fiacc’s list. So since the doom and gloom of stripping out Celtic Mist to the present where the aft cabin is rebuilt and painted, new heads with holding tank fitted, hull painted, anti-fouled and with shiny new anodes fitted it is ready to go back in the water. There is still a little welding of the wheelhouse to be completed together with painting, sanding and varnishing. The deck is due for an overhaul too and the rigging also inspected and, in some cases, replaced. Celtic Mist is now known as RV (Research Vessel) Celtic Mist and is looking magnificent. We are planning its official launch for second week in August, Sunday 12 August in Kilrush Marina, Co Clare and we hope you will all make it down. We have set up a committee to oversee and run the vessel (celticmist@iwdg.ie) and a dedicated website (www.celticmist.org) and we welcome more members involvement. Celtic Mist is a fabulous resource for the IWDG and as a member of the group it is your boat.